With the strong flavor of orange and strawberries, combined with creamy banana and a surprisingly smooth taste from spinach, you get at least 2.5 servings of fruit & veggies! Pretty awesome..
Editor's note: Use your favorite milk or yogurt in this recipe. Use ice cubes instead of water for a frozen treat. Most of the smoothie recipes I've seen are for 3-6 servings. 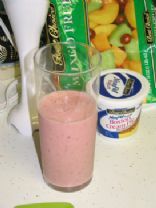 This is a good smoothie for just 1 person. It can be made with a stick blender instead of getting the big one dirty for just one drink! This naughty-and-nice smoothie recipe tastes like it's high in calories, but it's only 160 for the whole glass! Sweet, silky and completely satisfying. A healthy version of a classic fall favorite. This pumpkin smoothie is a sweet and healthy treat perfect for cooler months. This low-cal lemonade is perfect on a hot afternoon. For those of you who need a little assistance waking up, this is a great substitute for your regular cup of coffee. A tasty way to get your antioxidants. This drink can be made with a sugar-free ginger ale to lower the calorie and carb counts. Mmm, pumpkin spice lattes. The craving hits with the first burst of cool air. Save money and calories by making them at home. This refreshing and not-too-sweet beverage is almost too pretty to drink. Almost! A Delicious Fat-free Alternative to Starbucks! 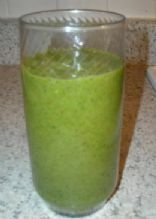 A yummy drink when you need a boost of energy because it's loaded with vitamins and minerals. It will even help when that chocolate craving hits! Save HUNDREDS of calories with this margarita. Try out different flavors of powdered drink mix too! This frozen berry drink has only five calories per serving. Swap up the berries and gelatin for a totally new recipe. This qualifies for the vegan raw diet. Very tasty - no spinach flavor at all. An easy sweet and creamy treat. Packed with healthy fats! Give the gift of warmth with your own hot-chocolate mix. You can even customize the mix depending on the dietary needs of the gift recipient. If they're watching calories, use a sugar substitute. If they can't have dairy, substitute powdered soy milk. This milk shake tastes like a Reese's peanut butter cup. My children love it! Easy and diet-friendly punch for everyone! Whipping this otherwise old-fashioned hot chocolate creates the illusion of richness, but it's quite low in fat. This slightly sweet cider is a tasty alternative to the traditional apple version. This is a home made version of the steamed milk I like to get from Starbucks. It's much cheaper and just as good! No added sweets. A good, good for you treat! This homemade alternative to store bought drinks is intended to replace electrolytes and carbohydrates during/after endurance workouts or exercise in hot, humid weather.